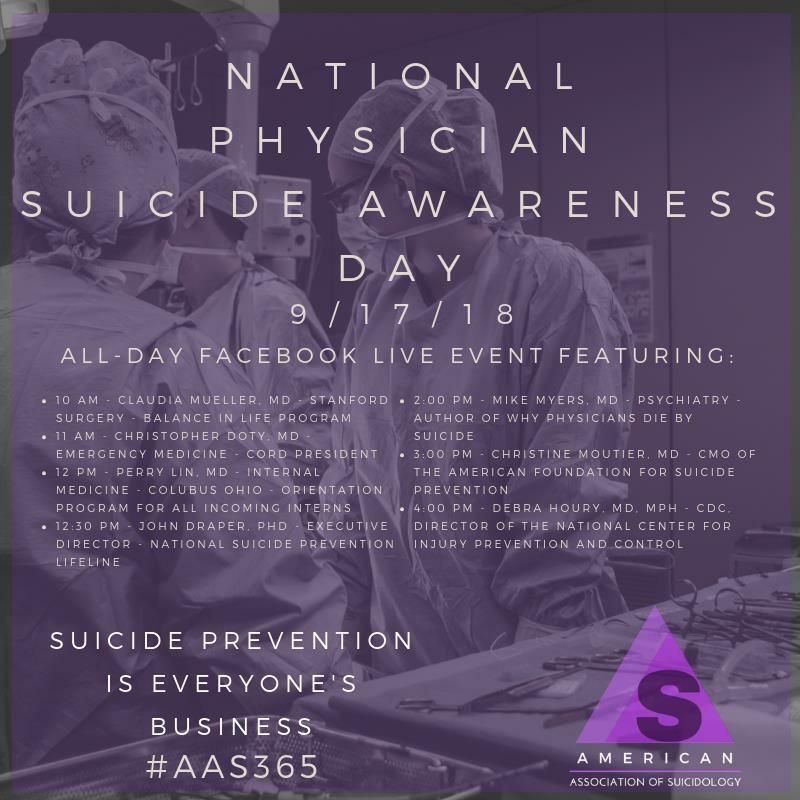 September 17, 2018 will be the first National Physician Suicide Awareness Day. The Council of Residency Directors (CORD) for emergency medicine has lead this initiative by uniting professional organizations to join in shining a light on a subject which too often is marked with silence and shame. The American Medical Women’s Association has added their voice to the increasing list of organizations calling for awareness and a change of trajectory with physician suicide. It has been known for 150 years that physicians kill themselves by their own hand much more than do members of the general population. Perhaps it is the daily burden of responsibility in making life and death decisions for others who, despite our best efforts, may still have poor outcomes. Perhaps it is the psychological impact of repeatedly seeing suffering. Perhaps it is the competing demands of work and family and feeling as though no matter what we are doing, someone expects us to be doing something else- this is especially true for women physicians who, on average, perform 70% of the work at home in addition to their practice as physicians. Perhaps it is choosing to care for others before we care for our own health. Perhaps it is just a characteristic of those that choose this line of work, although the incidence of depression is the same for those entering medical school as it is among the general population. It may be a combination of all of these factors. What we know, however, is that while burnout is common among physicians, and burnout can potentially lead to depression, burnout and depression are not the same, and burnout alone cannot explain a physician’s risk for suicide. Women physicians present a unique situation. In Western society, women attempt suicide two to four times as often as men, but men die by suicide three to four times more frequently than do women. This ‘gender paradox’ is usually attributed to the fact that men more frequently use firearms, a more lethal means of suicide. Medical training eliminates the ‘gender paradox’ with suicide. In fact, women attending physicians kill themselves 2.27 times the rate of suicide of their general population female counterparts- while male physicians have only a 1.41 times increased rate as their general population male counterparts. We also know that physicians avoid treatment for mental health issues because of stigma and fear that their credentials and license could be compromised. They may also feel that depression and other mental health issues may be time-limited or can be self-treated. Shame and embarrassment can present barriers to proper diagnosis and treatment. Women who balance the responsibilities of work and family may face additional time constraints to seeking treatment for themselves. Because of this increased suicide risk among women physicians and because we know that avoidance of potentially life saving treatment is common, the American Medical Women’s Association joins with CORD and other organizations in our commitment to breaking down stigma around depression among physicians, encouraging individuals to develop a personal crisis management plan, and promoting awareness of early warning signs among physicians, medical students, and their significant others. We cannot optimally care for others unless first we care for ourselves and also allow others to care for us.